Mick Jackson is an award-winning novelist and screenwriter. 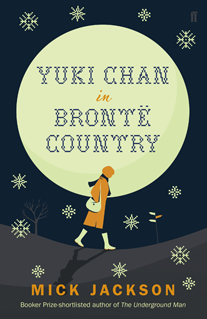 His latest book, 'Yuki chan in Bronte Country', was published in January '16. His previous novels are The Underground Man (shortlisted for the Booker Prize and winner of The Royal Society of Authors’ First Novel Award), ‘Five Boys’ (Encore Award runner-up) and ‘The Widow’s Tale’ (East Anglian Book of the Year). He has also published a collection of short stories, Ten Sorry Tales, a novella, Bears of England (both illustrated by David Roberts) and an e-book story collection, Junior Science. Mick’s new novel is the story of a young Japanese woman retracing her mother’s footsteps around Haworth and the surrounding moorland. Yukiko sees herself as a psychic detective, trying to make sense of her mother’s visit ten years earlier and the events that led to her subsequent death. Accompanied by Denny, a local girl, and with nothing more than a handful of photographs, Yuki slowly establishes the truth, via spirit photography, mediums and the man who invented snow. In 2007 Luis Cook adapted The Pearce Sisters (from Ten Sorry Tales) for Aardman Films. It won many prizes, including a BAFTA for Best Short Animation. A half hour documentary Mick made for BBC2 about a gang of men who paint pylons. An article from October 2010, about the author on retreat at Buckfast Abbey. Mick writes about his experiences as writer-in-residence at the Science Museum for the Faber blog. An unpublished short story, commissioned by The Verb / Radio 3 and inspired by a visit to a disused observatory.